SpierHead Winery is one of the most consistent quality wine producers I know in the Okanagan. I am always impressed with their Pinot Noir and white wines. I recently received their 2015 vintage of Pinot Gris, Chardonnay, and Riesling wines. All 3 wines knocked my socks off. Such great quality, and fresh BC fruit flavours. Just open and pour. No need to decant. FYI, 2015 was an exceptionally good year for BC grapes. I really hope you give these wines a try before they sell out. I predict many wine awards. 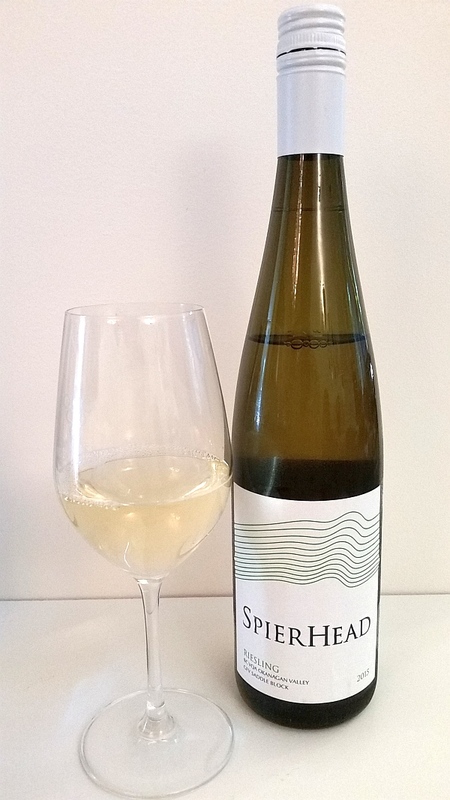 SpierHead Winery Riesling 2015 ($20) – Medium plus lemon in colour. A pronounced nose, with intense aromas of flowers, candied citrus, grapefruit, and lime. The aromas are so ripe on the nose that you would expect sweetness on the tongue, but you would be wrong. The wine is dry, with medium roundness and a light acidic prickle. Pronounced intensity flavour, where lime really dominates, followed by citrus, green apple and pear. There is also some minerality to this wine. It has a medium length with mouth-watering acidity. Tart lime and citrus, along with lime rind on the finish. I think this wine has very good aging capability. Buy some to try now, and cellar some to try 3 years from now or longer. This wine would of course work well with BC seafood, but also I think the lime tone matches well with Mexican dishes. Rating: A well-made Riesling, with big aromatics and flavour of lime, citrus and apple. 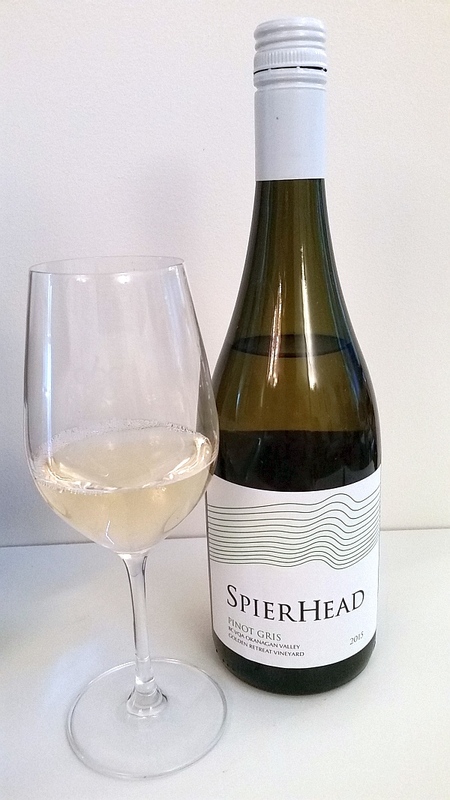 SpierHead Winery Pinot Gris 2015 ($19) – A medium plus nose that is very fruity; peaches, ripe pears, and grapefruit. Hints of lees and honey as well. The wine is slightly off-dry, some roundness on the palate, with refreshing acidity and light acidic prickle on the tongue. Medium plus body and flavour intensity. It starts off with ripe apples and pears, followed by peach, green melon and apple. You also get a hint of grapefruit and almond. Some minerality is also present. With decanting you get some smoke or flint. The wine has a long finish, with refreshing acidity throughout the length. Pears, citrus and other stone fruit as well as pepperiness on the finish. My first thought to pair this wine was with a salad topped with pan seared scallops. Rating: A fresh expression of BC fruit in the glass! SpierHead Winery Chardonnay 2015 (~$22) – A deeper lemony gold in colour. It has an intensely tropical fruit and vanilla nose, followed by lemon and butter. With decanting it adds some leafiness and nutmeg. The wine is dry, with medium acidity, but is very full-bodied; silky, round and heavy in the mouth. It really feels like QUALITY. You also get light acidic prickle upon first sip. The wine has mostly tropical fruit flavours, followed by pears, apricots, apples, and hints/texture of oak, vanilla and butter. Medium plus length, finishing with more tropical fruit, some apricot, and sweet spices at the very end. A bigger, riper Chardonnay that you want to show off with a delicious roast chicken, or maybe dare to pair with a roast suckling pig! Rating: An outstanding wine, with harmonious components between fruit, acidity and oak. You can buy these wines through the SpierHead Winery website or through these retailers. In case you were wondering about their Pinot Noir, here is a copy of my latest reviews which I did for the BC Pinot Noir Review. Note that these are the 2014 vintages. The 2015 release is yet to come. SpierHead Winery Golden Retreat Vineyard Pinot Noir 2014. Deep garnet in colour with a little dullness possibly from being unfiltered. The wine is developing with medium plus intensity on the nose. Red fruit, black fruit, red cherry and candied cherry, as well as red plum fruit aromas. Also detected vanilla and light meatiness. With decanting the intensity on the nose slightly decreased and the meatiness disappeared. The wine is slightly off-dry as it has some sweetness on the entry. Medium tannins, alcohol, and body but medium-plus intensity of flavour. It is round with a soft mouthfeel. It has red fruit, black fruit, red cherry, and black cherry fruit flavours, as well as vanilla, a hint of perfume and light meatiness. With decanting we also detected some minerality. The wine has a medium plus length. The sweetness persists to the finish. It has firmer tannins on finish then the other Spearhead wine. Ripe red fruit on the finish along with vanilla. Quite a nice wine big fruit flavour. Could age 4 to 8 years. SpierHead Winery Golden Retreat Vineyard Saddle Block Pinot Noir 2014. Medium garnet in colour that is translucent to the core. It has a medium minus intensity with red cherry red fruit and vanilla aromas. There may also be a hint of acetone. Also detected vanilla, sweet spices, cloves, and rose. With decanting we also detected some smoky notes on this wine. It is dry but has a sweet entry. A light mouthfeel and is semi-round. Medium acidity, tannins, alcohol, and body. Red cherries, candied cherries, strawberries, black currants, and red fruit flavours. There is a light vanilla and a hint of cloves. It has a medium plus length with some pepperiness and red fruit on the finish. Fine tannins. It’s ready to drink but can age three to five years.